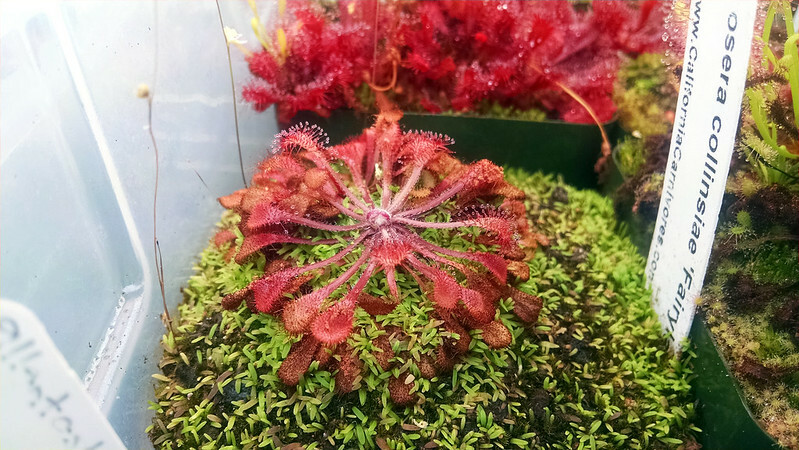 Plants I haven't mentioned in a while |Sundews Etc. Sometimes it seems like I'm always posting about the same plants. Today I decided to check out a few species that I haven't paid much attention to lately. Drosera collinsiae has been looking weirdly unhappy for the past month or two. At least the Utricularia bisquamata is going strong! It looks sort of the way it does when it's heat stressed but that's definitely not the problem right now. This has never been a very vigorous plant in my conditions though, so it could be anything really. I wish it would perk up though! The neighboring Drosera affinis is doing much better. Quite dainty. I like it. I don't mention it much, but I really like this species. 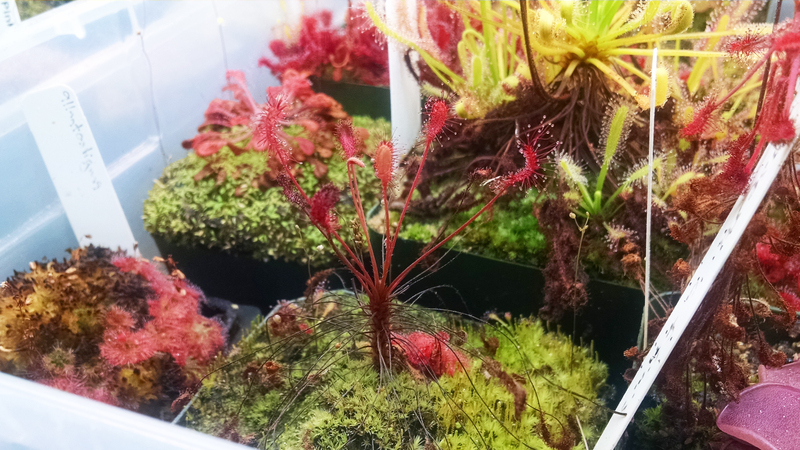 Its stem-forming habit is great – distinctive, but not ridiculous like Drosera madagascariensis. It's an elegant, delicate-looking plant. 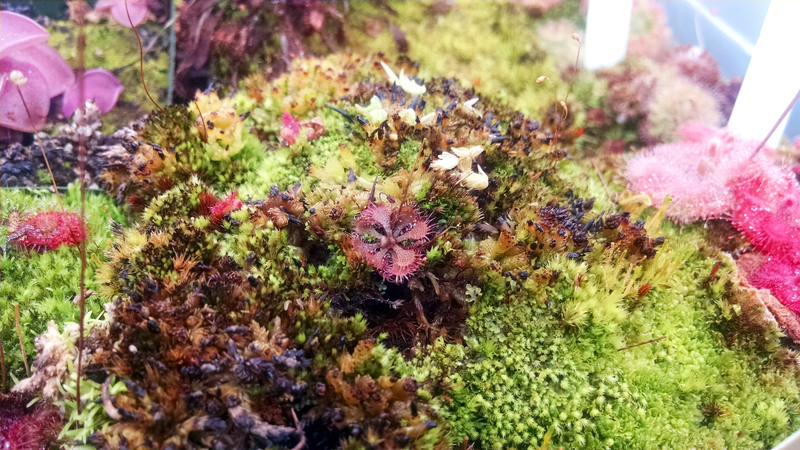 I dug out some of the moss from around Drosera brevifolia so it can have a bit more room now. Maybe I can feed this guy again soon and encourage flowering. I hope I didn't damage the roots in doing so. I really need to get this plant to flower one more time so I can start a new pot and throw this one out. That Sphagnum is really awful stuff, very dense and stiff. It just totally swallows up plants and doesn't even look nice. 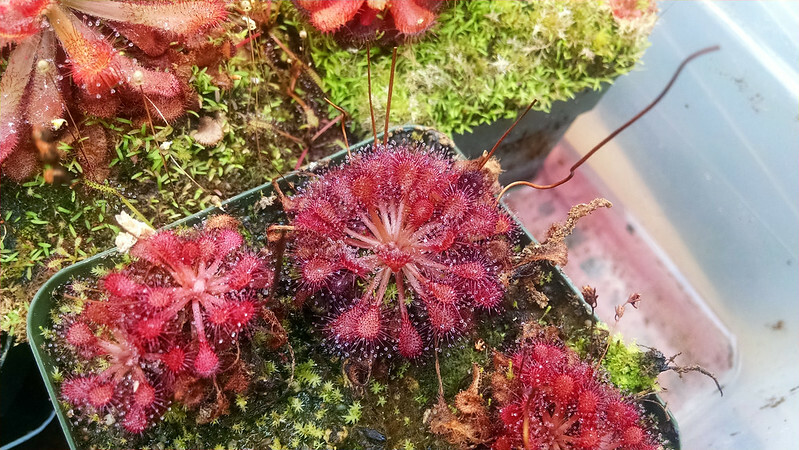 I got this long-armed form of Drosera capillaris in the last NASC auction because I liked the location data: Tate's Hell Swamp, FL. It's actually a really handsome plant though! That's one of the best red colors in my collection, and it's supporting a really large amount of leaves. Very vigorous plant, I like it a lot.